Haiti Solidarity T-Shirt - Support Grassroots Relief ! Home > Black History & Civil Rights > Black History & Civil Rights T-Shirts > Haiti Solidarity T-Shirt - Support Grassroots Relief ! 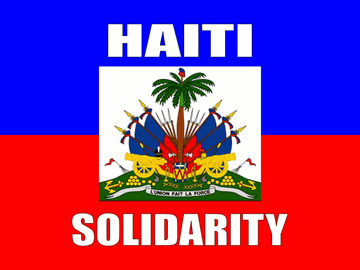 Take a stand in solidarity with the people of Haiti! Half of proceeds from the sale of this shirt will go to the feeding program for children at St Clare's Church, Tiplas Kazo, Port-au-Prince. The program was started in March 2000 by our good friend the late Father Gerard Jean-Juste with help from Margaret Trost of the What If ? Foundation. Part of the proceeds will also go to support the work of the South Florida Haiti Solidarity Committee, which supports the popular movement in Haiti in it's struggle for democracy and social justice.